This is an extraordinary election. On the one hand, we have cruel but competent Tories; on the other, well-meaning and inept Labour. The Tories are not widely loved, but it's unclear if Labour could even function as a government. I would love to elect a government led by someone both competent and humane, but this option will not be on the ballot paper. The choice today is between brutal efficiency in pursuit of a disastrous agenda, and gentle inefficiency in pursuit of a better world. Monbiot is wrong. To see why, let us consider the word "humane". In order to be humane, it is not enough to have good intentions. If I sit around thinking nice thoughts while my child goes hungry, that is not humane behaviour. Being truly humane requires action and hard work. 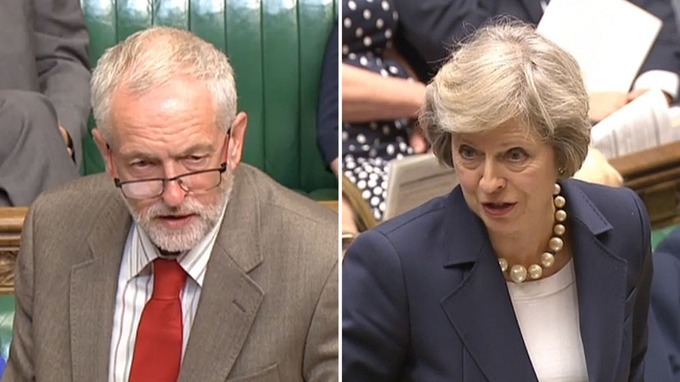 Jeremy Corbyn and Theresa May. Say what you will about New Labour in the 1990s, they were not lazy. If they made a commitment like reducing school class sizes, you could be confident they had a detailed plan to implement it. The plan didn't have to be fully public; but someone, somewhere had made schedules, resource allocations, benchmarks and contingency measures which were more or less based in reality. It's a bureaucratic grind and most of us wouldn't find it very exciting, but it is important. Effecting even modest change on a national scale requires a huge organisational effort. The NHS alone is the fifth largest employer in the world -- after the Pentagon, the Chinese army, Wal-Mart and McDonald's. Redirecting its course is very, very hard. Some of New Labour's managerial zeal came from insecurity. After 18 years in opposition, very few of Blair's front bench had any government experience; they were sensitive to Tory criticism that they had never run anything of consequence, and overcompensated with a frantic devotion to plans and targets. There is a fine line between "organised" and "control freak" and they often sailed across it, which brought its own problems. But if New Labour said they would do something, there was a good chance they would be able to do it. Today Labour has been in opposition for seven years, but it feels much longer. Former cabinet ministers have left Parliament (David Miliband, Ed Balls, Sadiq Khan) or gone to the back benches (Yvette Cooper, Hilary Benn). Corbyn has a fashionable disdain for expertise. There is nothing in his lengthy career to suggest he cares about or even understands the hard work of government, and most of his shadow cabinet are no better. Corbyn was a backbench MP for thirty-two years before becoming Labour leader. He did not spend that time on anything constructive in domestic policy. Instead, he was busy with foreign affairs and defence, above all his leadership of Stop The War Coalition. Protest marches are simple by comparison: Turn up, hand out placards, shout slogans, and repair to the pub with a warm glow of righteousness. Corbyn has found that running the Labour party is altogether more challenging, and has not coped well. There is no reason to suppose he would do any better with the further leap to running the British government. Monbiot, and probably Corbyn himself, would like us to overlook all this. They have flipped the New Labour slogan "things can only get better" to "nothing can possibly get worse". This is simply not true, and it's an insult to our intelligence to pretend that it is. Take childcare. One of Labour's ten election pledges is a National Education Service with government-provided childcare for all. It could be wonderful: Happy children play and learn in modern, airy buildings, supervised by capable and caring staff. It could be a nightmare: Inadequate staff, insufficient resources, children who are unhappy or even unsafe. Setting up a National Education Service, by its nature, would disrupt the existing marketplace. Suppose my current childcare provider is nationalised, goes out of business, or raises its prices to a level I can't afford, such that I have no choice but to use the government system. Does the competence of the people who built that system matter? I am talking about my two-year-old child. Yes, this matters to me. It's very easy to think of other scenarios where Labour incompetence could hurt us, from a botched Brexit to a currency crisis to renewed conflict in Northern Ireland. Ineptitude has a way of allowing small problems to grow into disasters, and disasters to become catastrophes. When governments get things badly, badly wrong, we are looking at food and fuel shortages, power cuts, riots in the streets, and dead bodies on the ground. If Prime Minister Corbyn got us here, it would be very little comfort he had started with the best of intentions. If Monbiot thinks this unimportant, then at best he is a fool, who has let hatred of the Tories blind him to all other considerations. If he believes unthinking Tory-hatred is an election-winning slogan, he is an even worse fool. Even in Scotland and Wales, Conservative toxicity is not what it once was; in England, it is hardly there at all. If all this sounds like an endorsement of the Tories, it's really not. If I'm being harsh on Labour, it's because I'm disappointed; they used to be better than this. Meanwhile, it is not surprising the Conservatives are being devious, cruel and selfish. So is my cat when she catches mice; it's in the nature of the beast. The Conservatives have made themselves into the party of cruelty. They barely pretend to have a positive vision for the country. Their plan is simple: Reward the powerful; demolish public services; and distract everyone by punishing the poor, the disabled and immigrants. If the election returns a Conservative government with an increased majority, as it likely will, we have a pretty good idea what it will do. It's possible May will feel empowered to sideline her more deranged Brexiteers, and act on some of her rhetoric about helping struggling families, but I doubt there will be much substantial change of direction. As governments go, May's is probably below average in imagination and ability. It's much more Brown struggling with the financial crisis in 2009, than Blair striding confidently forward in 1997. But even a below-average government is miles ahead of the sorry state of the Labour party. If Labour by some miracle wins power, Monbiot sketches a government which doesn't achieve much for good or ill, stumbling along ambiably without having to make any important decisions. I don't believe such a government can exist, least of all now. John Major (1990-97) and Gordon Brown (2007-10) led exhausted governments, of parties too long in power, bereft of ideas and riven by internal conflict. They were not particularly successful leaders. Yet both handled the aftermath of financial disasters, Black Wednesday and the banking crash respectively, with a fair degree of competence. In the shape of Brexit, the UK faces a diplomatic, economic, and administrative challenge such as it has not seen since 1945. It makes the 1992 and 2008 crises combined look like a minor inconvenience. Jeremy Corbyn is not up to the challenge, as Monbiot himself admits. It may be that like Forrest Gump, he will blunder through to a more or less satisfactory outcome, powered by blind luck and good intentions. This pallid fairytale appears to be Monbiot's best-case scenario. I don't find it plausible. The question is not whether Corbyn's incompetence would hurt us, but where and how much. Nobody knows the answer to that, least of all Corbyn himself. It depends on how many of his ambitious pledges he tries to implement; what sort of mistakes he makes along the way; and how he reacts to events, both the slow-motion crisis of Brexit and any unexpected challenges that occur. As Donald Rumsfeld might put it, the choice of Tories and Labour is between a known known, and a known unknown. The dangers on either side are formidable; but considering the opinion polls, the electorate strongly prefers cruelty to chaos. So what can we do about it, other than wail in despair? I don't have any general advice. All I can suggest is to look at your local circumstances, and decide accordingly. I'm finding my personal choice quite easy. I live in Cambridge, one of the few Labour-LibDem marginals. The excellent LibDem MP Julian Huppert was ousted by Labour in 2015, and is now seeking to win the seat back. I will vote for Huppert on 8 June with a clear conscience. Elsewhere? It depends on the Labour and Conservative candidates, and whether Lib Dems, Greens, or nationalists have a realistic chance of winning. I find myself in the uncomfortable position of agreeing with Tony Blair here. If you can, try to vote for a candidate who will hold the government to account; one who grasps the scale of the challenges we face, and is not afraid to speak truth to power. Realistically, the next government will be Conservative with a substantial majority. The best we can hope for is a Parliament which provides a high quality of scrutiny and debate, from whatever party.